If you’re like me, you need a breakfast that can keep you going all morning, but that is also quick to make. Perhaps you are also one of the millions of Americans that, like me, has high cholesterol and thus has a higher risk of heart disease. 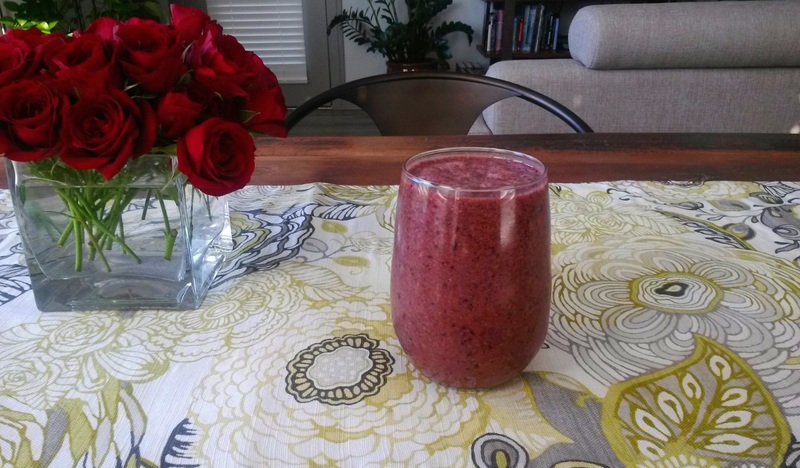 Enter the Heart-Healthy Power Breakfast Smoothie. It is easy to make and drink on the go, is packed with heart-healthy ingredients, and keeps me full until lunchtime. Tart cherry juice gives the smoothie its gorgeous color and tangy taste. Tart cherry juice is packed with nutrients, has anti-inflammatory properties, and may even help with insomnia. 5 grams of fiber never tasted so delicious. Frozen blueberries add texture and flavor. They are high in antioxidants and can help lower blood pressure and prevent LDL oxidization – two elements that contribute to one’s risk factor for heart disease. A banana adds a rich consistency, some more fiber, lots of nutrients, and can help regulate blood sugar. You won’t even taste the spinach as you get a daily dose of leafy greens, full of vitamins and minerals. Ground flax seeds also don’t add noticeable flavor but do add more fiber, are a good source of omega-3 and omega-6, and are the richest dietary source of lignans – all making flax seeds incredibly heart-healthy. Shelled hemp seeds add a slight nutty flavor to the smoothie and bulk up the consistency. 3 tablespoons contain 10 grams of complete protein, which helps keep you going strong all morning. They are also a good source of omega-3 and omega-6 and may reduce the risk of heart disease. Process in a blender until smooth. Makes one serving. I'm equal parts Ph.D. economist and yoga teacher. View my full professional profile at https://www.linkedin.com/in/katherinesauer.